Jacob deGrom is the best pitcher in baseball. It’s not often you can make such a definitive statement like that and feel so certain you’re delivering the truth. The Twins beat the best pitcher in baseball tonight. In fact, they crushed him. deGrom entered tonight’s game on one of the best streaks in baseball history. He was dismantled by the Twins. deGrom not only won the Cy Young last season, he even finished fifth in NL MVP voting. He had 26 consecutive quality starts heading into tonight’s game, which tied Bob Gibson’s record. He had a scoreless streak of 26 innings and had gone 41 starts without allowing multiple home runs coming into tonight. All those streaks are over. The Twins tagged deGrom for six runs, all earned, on eight hits and a walk. Mitch Garver took him deep twice and Eddie Rosario also homered off him. This is Garver’s first multi-homer game, which apparently is the result of him doing some extra homework. If it looked like he was prepared for that pitch on his first home run, it’s because he was. This Twins lineup has had some hiccups early, and playing without Nelson Cruz in these National League games hasn’t helped, but tonight they proved that when they’re rolling, even the best pitcher in baseball can’t hold them down. Listening to much of tonight’s game on the radio, I couldn’t tell if all the sounds coming through the background were the roar of airplanes taking off from LaGuardia Airport or screaming baseballs flying out of Citi Field. 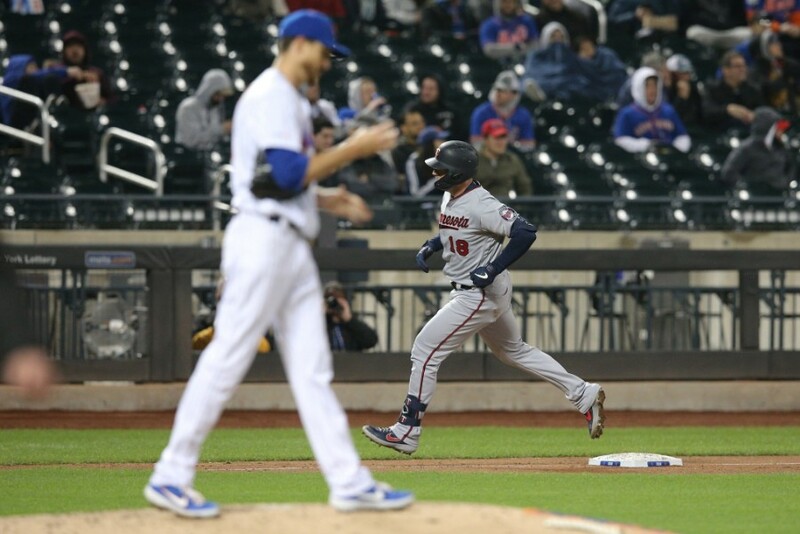 In addition to the three homers hit off deGrom, Jonathan Schoop hit his first two home runs with the Twins, Jorge Polanco added another and the Mets slugged four homers of their own. Byron Buxton didn’t go deep, but he did hit a couple of laser beams for doubles. That gives him five extra-base hits in eight games played so far this season, which is more than he had in 28 games all of last year. 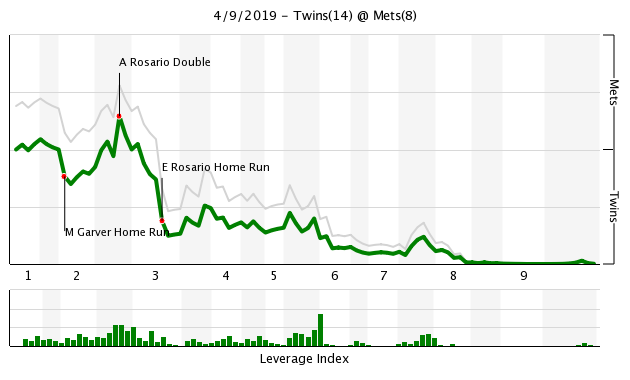 This game ended up a blowout, but it appeared for a moment in the middle innings that the Mets were on the verge of mounting a comeback. Kyle Gibson was laboring in the fifth inning with the Twins up 6-3. He gave up a leadoff double, retired the next two batters but then walked the bases loaded. Twins manager Rocco Baldelli went to the pen and Trevor Hildenberger retired the only batter he would face on the night to end the threat. After Trevor May pitched a scoreless sixth inning Adalberto Mejia got the first two outs of the seventh, then Baldelli called on Blake Parker, which was interesting since we had not seen him used prior to the ninth inning yet. Anyway, so it was almost as if Baldelli managed his bullpen backwards tonight, which I’d like to see more often when the Twins are holding a lead. Why save anyone for the eighth or ninth innings when you have no idea if your opponent will even be within striking distance at that point? This was a great game in what’s been a great start to the 2019 season. This win ensured the Twins will have a winning road trip, so it’s as if they’ll be playing with house money against Noah Syndergaard tomorrow. Thanks Tom! Assume De Jong is DFA's after tomorrow? We should be getting some bullpen arms back soon. I liked how Rocco managed the pen in high leverage situations. I did not see the much of Gibby's innings, was he nibbling like he did in the first game? He did have 6k's. We eventually will need some quality starts. Hope, but doubt Garver will be back behind the plate tomorrow. Thanks for the video uploads! That was really, really a fun game until the bottom of the ninth. I really liked the swings Garver put on those pitches by de Grom. That second homer he really hammered it. I also liked the call to bring in Hildenberger even though Gibson (I am sure) wanted to stay in so he could get a win, but if he walked another, I believe the Mets come back and beat the Twins. In that situation, the most important thing is to throw strikes, and Hildenberger is going to throw strikes. Really impressive especially considering Cruz was on the bench. Sano is going to have to really earn his playing time when he comes back, and an extra-motivated Sano is hopefully a very good thing. Hot bats was fun to see, but the 9th inning not fun. Let's gettem tomorrow. 1] 6-3. Early, but we have faced 3 of the top 10ish SP in the AL, went on the road to play 2 of the top NL teams and won/been competitive and are 6-3. 2] Early pitching offerings are very good despite a few clunkers. Who hasn't had a few so early on? 3] The lineup hasn't even begun to hit on all cylinders yet and looks dangerous, even with Cruz sitting on the bench the past few games. 4] Don't dismiss Gibson not being able to escape the 5th inning his first 2 starts. He fought a huge health concern to be where he is now. Frankly, I'm surprised he began the season on the active roster. And while he hasn't exactly been great, he's been a bulldog to do what he has through 2 starts. 5] Going to ignore nit picking much less the 9th inning tonight. We won. Somebody else will be in the pen tomorrow. Hopefully someone who can help. 6] Its a long season. There's a ton of things that can go wrong. There's a ton of things that can go right. There are still some obvious needs for the BP, despite smoke and mirrors, and some hope for the 5th SP option when needed. But this a really, reaĺly nice start. The Twins are good again - there I said it! ...feels really good to get that off my chest. Most encouraging part of the game for me was to see Hildenberger, a purveyor of inherited runners scoring, come in with the bases loaded and needing one out to get out of the inning.... and he did! That is how you spell relief! I really cringe when I see a one sentence statement that makes it appear that Harper has performed flawlessly. Against the Phillies in the first inning with the game only 2-0 on Friday - he let the game turn into a route and let all 3 runners with two outs score on the first pitch - a 74 mph hanging curve right down the middle that was blooped for a bases clearing double! (Albeit with some defensive gaffs) Just saying "Harper has now pitched 3 ⅓ scoreless innings for the Twins" really is not telling the story. He did get the last out in the 8th after Rodgers had to be lifted with 2 out and runners on 2nd and 3rd on Sunday. So he is 3/5 inherited runners scoring. That is also part of his young story. I love that a Gibson was on the mound opposing deGrom when he was prevented from breaking Bob Gibson's record. A tie is good enough, especially since most of Gibson's streak was complete games. De Jong threw 46 pitches in the 9th? Whoa. 3rd base production has been horrible. I don't know how much he will have to work. He will be welcome. He can't really do any worse, but I hope he will be "extra-motivated" just the same. "De Jong threw 46 pitches in the 9th? Whoa." LOL. He should get the win just for pitching half of a game in one inning! Defense has been solid, and I’d expect the bat to pick up for Marwin. But yeah, luckily for Sano he’s off to a slow start. @MitchGarver called his shot today, deGrom is going to throw me a slider outside and I’m taking him dead center!!!!!! Are you kidding me!! The obvious encore is to point his bat at the outfield stands, ala Babe Ruth's called home run, and then hit the next pitch out. Here's hoping they don't come high and inside. Interesting note on how Baldelli basically worked the bullpen "bullpen backwards." Great insight. It was an effective strategy and was really pleasing to see it work. I think it is a good example of the Falvine influence really starting to show. This is coming from a Molitor supporter - I wonder how Molitor would have managed the pen last night and would it have made a (negative) difference? Garver may never be a gold glove catcher, but he sure played a heck of a game yesterday. Going 4/5 and receiving well over 200 pitches and blocking all those Gibson dirt balls was encouraging. I'm sure he'll get the day off today, so that stick will be missed. Hope he waches the 1st inning over and over again to see the difference in approach. Throw strikes, he's fine. Nibbling results in walks and all kinds of problems. Could not throw his curve for strikes. With the way Garver and Astudillo have been playing, would it be reasonable for the Twins to at least look into trading Castro?? What a fantastic game to watch. I have the utmost respect for Bob Gibson, who in my opinion was one of the greatest pitchers ever.Never saw him pitch, but recall how dominant he was at that time.Thank You Twins for keeping his amazing record on the books versus sliding to Number 2. There has been lots of talk about roster revamping.The Twins have what, three potential bullpen guys (McGill, Mayo and Reed) on the IL and will need spots for a couple at some time over the coming weeks.DeJong is one spot, if not gone by Friday, and Harper is probably another. Doesn't solve what to do when Sano is ready.But can you imagine this lineup if Sano finally turns the corner and hits like we know he can? 2 HR's each from Schoop and Garver. And hey, let's not forget the offensive nights from Rosario, Polanco, and Buxton - they are heating up and looking good right now. Twins offense seems to be firing on all cylinders without Cruz, which is crazy. The pitching from Gibson wasn't good. At all. He's nibbling and really getting himself into trouble. It was hard to watch, frankly and he looked like the second coming of Mike Pelfrey out there for a while. That tummy ache he had 2 months ago isn't going to work as an excuse any more. De Jong was a De Saster and really was a wet blanket on what still ended up being the most fun win of the season. Thrilled with the work by May, Hildy, and Parker. Would really like to see an efficient outing from Odorizzi tonight. Twins are in need of a quality start from someone not named Berrios. I think Jake can deliver. Cleveland keeps winning and is now 7-3. Mets look good, that AL East is going to be a great division this year. That tummy ache he had 2 months ago isn't going to work as an excuse any more. Yeah, recovering from an untreatable E. coli infection that caused Gibson to lose almost 20 lbs is a pretty good excuse for a less than stellar start to the season. For what? I'm not sure anyone wants him. We should swap out the Mets with the Yankees in the AL and NL. Think how many world series we would've won in the 2000s if we just made that simple switch! Really like Garver and Austudillo in the same lineup together.Both have good bats and make the lineup tougher IMO. What a night for Garver.He will be hard pressed to have a more impressive night the rest of his career.Two HR's against one of the best pitchers in Baseball, Wow. I really liked that lineup and if you through in Cruz and eventually Sano it kind of becomes pick your poison for pitchers.If they stay healthy this should be a fun offense to watch. I have the utmost respect for Bob Gibson, who in my opinion was one of the greatest pitchers ever.Never saw him pitch, but recall how dominant he was at that time. I am old enough. Bob Gibson (in 1968 especially) was incredible. And scary. It was a much different game in that era and Gibson embodied it with his high and tight fastball (once clocked at 103.4) to anyone that challenged him. He ended his career with 255 complete games. Twins have earned a "honeymoon" game tonight because mission accomplished on road swing against Phillies and Mets. I believe that the 2019 version of the Minnesota Twins will compete in every game. BTW, last night Jonathan Schoop showed a preview of what he is capable of while Dozier is the same old Dozier for the Nationals. Might as well win tonight just for the fun of it. Go Twins!